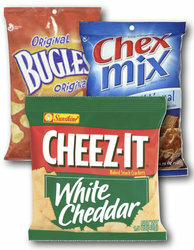 Chex Mix, Cheez-It and Bugles (30 Count Variety Bag). This is just a general assortment of "Munchie" bags. Great snacks to have around and enjoy. Like all of our "Variety Packs", they come in a a clear drawstring bag for easy storage and distribution.